There are 5 posts in this thread, and it has been viewed 6971 times. 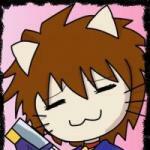 What do you think of Puzzle de Pon? 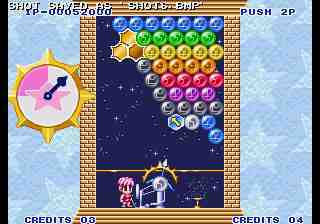 Puzzle de Pon is a puzzle game that's... really similiar to Puzzle Bobble. In fact, its the same exact game. There's a difference in the substance and characters, but that's about it. Puzzle De Pon! is a puzzle video game made by the Taito Corporation in 1995. 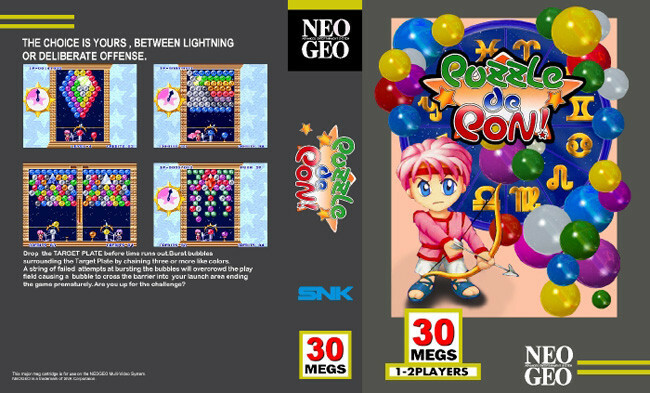 It was initially released for the Neo Geo arcade platform. 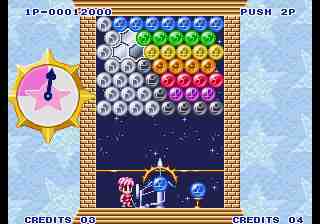 The game plays similarly to Taito's own Puzzle Bobble series. There are some gameplay differences however. Although the player clears the colored balls on the screen by firing balls against other balls of the same colour, the objective of the game is not to clear the screen of balls. It is instead to clear all the balls from around the level shape, referred to as the "drop token". Once this shape is freed, it explodes and the player travels onto the next level. There are 39 levels in the game, divided in groups of three levels. 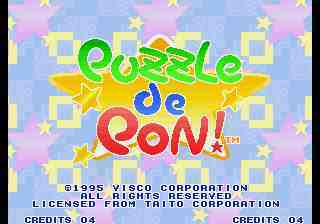 In 1997, a sequel to Puzzle De Pon!, entitled Puzzle De Pon! R!.The game concept is the same, but it features different stages. personally I really enjoy them. With the gameplay being so similar to the Puzzle Bobble series anyone who is a fan of those games should also enjoy this. The key gameplay difference between the two series is that the object is to free the zodiac item in each round rather than completely clearing the screen of bubbles. The music in this game is very good which is typical of games by Visco and I slightly prefer it over the music in the PB games. All in all an excellent and addictive puzzle game. Just a suggestion Cat but seeing as they're very similar maybe it would make sense to combine both Puzzle De Pon games into this one GOTW just like what happened with Breakers/Breakers Revenge. 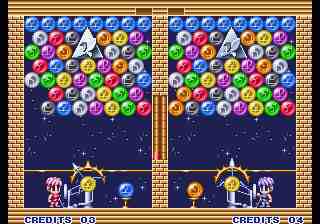 PDP is, and very much like Puzzle Bobble/Bust-A-Move, but different in certain aspects nonetheless. And I agree on what Merlin said, PDP and PDP R are both basically the same games, but one of them is a slight upgrade. I think Puzzle De Pon qualifies neither more or less than a Puzzle Bobble Mod and the story of Zodiacs is really nothing new or original. It makes me wonder what Visco was trying to prove in making this game. Come to think of it, I don't think Puzzle De Pon is up to standards and quality of the Puzzle Bobble franchise. If this game is worth playing, I'd either do it once or when there's nothing better in store.